Hello, we’re Born Tasty™. We’re flavour pioneers, here to get healthy back into people’s lifestyles with nutritious, natural food that’s packaged and prepared in ways you’ve never tasted before. We’re pretty sure you’ve noticed that the way we live is having a huge impact on the way we eat. Most of us have less time in our diets for anything like fresh fruit and veg. Well, we travel the world to find the flavours and recipes that help people eat more of the foods that do them good. Our products are made from simple, fresh and ethically grown ingredients. They’re already pretty great by themselves, so we do nothing but introduce tasty, exciting and innovative new ways to enjoy them. Which also means making them fit a whole lot better into the way we live today. We make products from fruit and vegetables rich in the essential vitamins, minerals and nutrients we all need to stay healthy. We’re changing the taste of snack time by bringing healthy new products and adventurous new flavours to the table. We care about what we do and about how we do it – from how our ingredients are grown and picked to the way our products are made and packed. Everyone needs to eat a bit healthier. Including us. This is our way of getting good food into a busy lifestyle. Our first Born Tasty product is non-other than Snackamolé, a new way to eat avocado on the go. 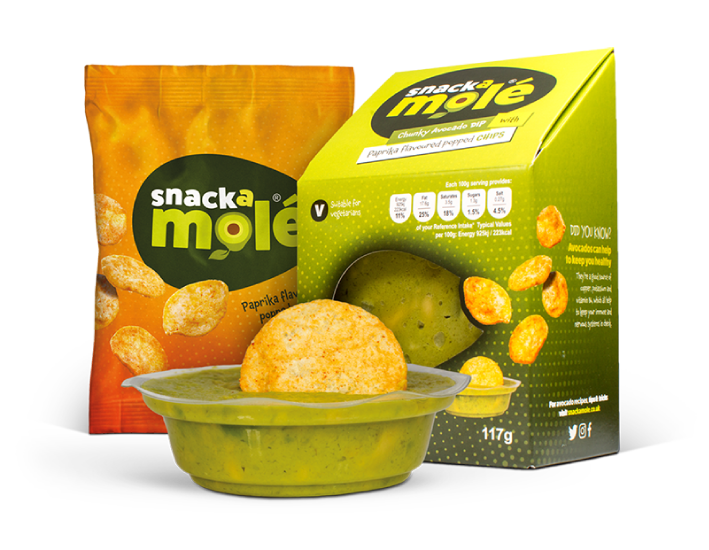 Snackamolé combines the benefits of a delicious avocado dip and a bag of paprika flavoured popped chips for dipping to create the perfect on the go snack for any occasion and any avo on the go.